The Brampton Flying Club (BFC) has been in operation since 1946. Originally based near McLaughlin Rd. and Queen St. in Brampton, the Flying Club moved to its present location in 1970. It is now the only flying club in Canada to own and operate an airport. 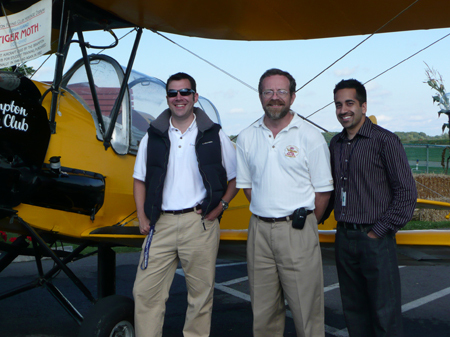 The flight school is respected around the world and produces many of Canada’s top pilots. The club owns 240 acres, 2 paved runways, clubhouse, flight training facilities, aerial advertising operation, restaurant, aircraft maintenance shop (AMO), pilot shop, aviation fuel facility, numerous hangars, tie-downs,Full-motion Red Bird simulator, Frasca flight simulator and 24 aircraft. BFC is a non-profit corporation owned and operated for its members. There are approximately 1000 members, and 70 staff are employed by the BFC. There are 162 hangars located on the field (75% are privately owned), and about 200 private aircraft are based here. The Brampton Flying Club (BFC) owns and operates the Brampton Flight Centre. The Brampton Flight Centre includes the airport, tenants and services.